compulsive viewing with two men who definatley do possess the X Factor in their respective games. Trump, who had eliminated two former world champions in Ronnie O'Sullivan and Neil Robertson to reach the final started strongly against Antrim's Allen as he took the first frame with a decisive break of 70 after Allen missed a red to the centre. Allen, who was bidding to become the first man from Northern Ireland since the late Alex Higgins to win the title was not about to let Trump have it all his own way and replied with a 56 to level at 1-1. And the bookmakers who had listed Trump as 2-1 on to win the title could well have been thinking of revising their odds with a string of errors from Trump. Namely in taking on a long range red that missed, leaving the cue ball to cannon into the cluster of reds, leaving them scattered in emminently potable positions, leading to a fantastic clearance of 141 from Mark. 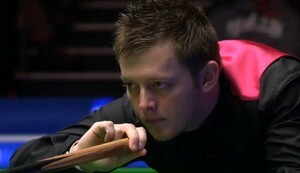 Allen then stretched his lead to two frames in the fourth frame which came right down to a duel on the colours which was settled when Judd's cueing led to the brown leaving the table. With the brown back on it's spot Allen cleared it and the blue to lead 3-1 at the mid session interval. But then deja vu kicked in for Mark, and from 3-1 up he found himself sitting in his chair for rather longer than he may well have wanted as Trump took full advantage of a missed red to the centre to make a vital 52 that saw him cut his deficit to just one frame. There was no holding Judd in this mini session as with bits and pieces he levelled at 3-3 and then rolled in breaks of 75 and 61 to translate his deficit into a 5-3 advantage and leave Allen in the same position he had been in against Ricky Walden. The question was - could Mark respond in the same fashion as he did against the Englishman. The answer was a no as despite having the first opportunity Allen ran out of position with just seven points on the scoreboard. Trump cpming to the table replied with a textbook break of 109. Trump leading 6-3 and the UK title was slipping away for Mark. To make matters worse having engineered an opportunity of a maximum for himself Allen could only look on helplessly when his long red to the yellow pocket failed to drop. A 40 points lead was soon whittled away by Trump who hammered in a 78 to stretch his lead to 7-3. The strain was telling on Mark and when he missed a straight red to the corner from the baulk line the spectre of defeat was looming large, and Allen could only sit and watch as Judd capitalised on his mistake, this time with a 74 to leave Mark needing two snookers. He found one as Judd hit the pink to elicit six penalty points, bad with four reds left and the colours well placed for snookering Judd knew he could not afford any slip ups. Allen was trying everything he could think of- even to the point of sitting in Judd's chair. It was to be all in vain as Trump drilled in a long straight red to move five frames clear. Three of the first four frames of the evening session had gone to Judd who was just two frames from victory. Allen badly needed the final frame before the mid session interval and he was in first with a long straight red and chipped in with a clearance of 139 to close to 4-8. Having lost seven straight frames it was a courageous response from the Antrim professional as he and Judd left the arena for the mid session interval. And the four frame deficit was further reduced when Judd's powerfully strike on the cue ball sent a red crashing off the table. With the balls kindly placed it was Allen who confidently struck back with a 133 to remind Judd he was far from finished. But Trump remained unruffled and after a miss on a red hammered in a 76 to re-establish the four frame gap. At 9- 5 Judd required just one more frame for victory. Still Mark refused to surrender, instead he rolled in a break of 125. The quality of the snooker from both players was outstanding, and a marvellous advert for the sport. There was further drama to come as Trump, who looked set for victory after an outrageous fluked red missed a red along the top cushion. Allen countered with 27, but in trying to double the final red missed it. The red though rolled away to safety, and seconds later Mark was back at the table, clipping in the red that Judd had left sitting over the middle pocket as he cleared to the pink to close to 9-7. Another chance went begging for Judd in frame seventeen when he ran out of position on 32. And after a bungled safety that left the Antrim man among the balls Allen confidently stroked in a 95. Judd's lead, which had been 8-3 and 9-5 had plunged to 9-8. 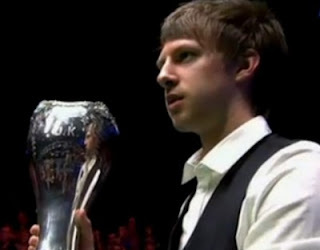 But it is also a testament to Judd's strength of character that he was able to withstand such a tenacious and gutsy fightback when he pounced on a simple red that Allen had left in attempting a deep screw shot and slowly but surely inched his way to a match winning break of 91 to seal a momentous victory of 10-8 against a gallant opponant. Nevermind who won X Factor. Snooker once again remains the best reality show, at once again was the main winner tonight here in York.